8/23/2017: The RG’s Austin Meek’s report on this porkfest is unusually incurious. In fact this new contract is not a pay cut as Meek suggests, it’s a $50K raise for Horton to $500K a year, plus some new and remarkable bonuses. Although the old contract did guarantee him $90K for ticket sales that never happened, so I suppose you could see it as a cut. In any case, not bad for a man who sold about $160K in tickets last year, and whose team costs UO at least $2M a year in subsidies. For contrast, $2M is more than the UO administration seems willing to spend on merit raises for ~800 tenure track faculty over the next 2 years. Just kidding, the players do the work, but the money is “earned by Coach”. The 45 days is real though – these jocks really don’t trust each other, do they? Soon we’ll have to pay them in bitcoin. The new contract also makes clear that Horton is not a faculty member – something the UO GC’s office has claimed of coaches in the past to try and hide their public records – and also that he’s bound by standard UO ethics policies etc. Apparently the women’s softball team did not react positively to the idea of a merger. Austin Meek has more in the RG here. UO spokesman Tobin Klinger said President Michael Schill is “working to determine the best approach forward,” but suggested it is unlikely he would take any away from athletics to mitigate cuts to academics. Schill did not respond to multiple email requests for comment. I think it’s time for someone new to let the new administration down going forward. If the Athletic Department is self sustaining why are they using the University of Oregon in their name? Maybe the University should charge them for the rights to use that name. Wait – UO has a baseball team…? In keeping with the UOM “bang the drum slowly” baseball comment policy, please don’t say this more than once a day. 2016 photo. George has added another 20 pounds since. Nope, academics will never get a single dime from athletics. Baseball won’t get cut until every last professor has been laid off and tuition costs more than the national debt. Schill didn’t even cut a dollar off athletics before going back to the HECC. Hopefully they remind him of our priorities, not the whims of some out of state rich trustees. 17 Million? Now we know where the 25 or so million shortfall in teh UO budget comes from. But wait – it’s NOT a problem. Let’s raise the tuition! On a lighter note. UO Baseball? The proverbial sticky wicket! A certain level of unreality here, as often happens with athletics? 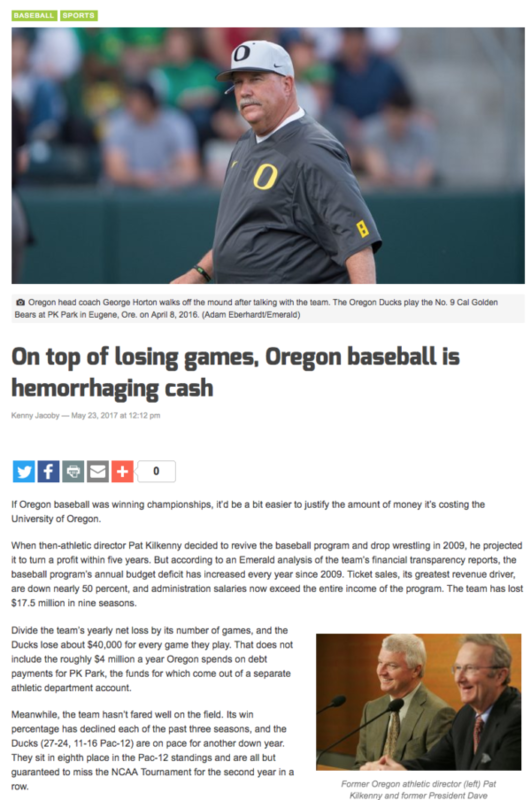 I don’t see what the annual baseball deficit has to do with the UO academic budget. As long as Uncle Phil, or someone else, is willing to blow their money on athletics, without asking for anything from academics (or anything more than the little they take, talk to the accountants), I don’t see much of a problem with it. The dough in the athletic budget, Ducks “legacy” endowment, etc. is not currently and probably in the case of the endowment, not legally available for academics. I suppose UO could try to “tax” Uncle Phil’s athletic contributions. I don’t think this would be a great idea, because he might get turned off to ever giving more money to UO academics (the “old campus” not the “Knight campus.”) Of course, that might already be a lost cause, but an attempted tax might kill it off completely and forever. If the athletic enterprise is not self-funding, it’s not profitable. If it’s not profitable, it’s not returning to the academic side; it is, in fact, taking from the academic side. Long-time readers may have noticed a trend by now where the athletic enterprise has historically been taking from the academic side. While not the only reason, the baseball deficit does, in fact, have to do with the UO academic budget. I believe you are simply misinformed about UO athletics financing. I am, admittedly, applying a larger generalization about the state of the athletics enterprise in D1 schools. There is another, more nebulous aspect that could easily allow one to argue, as Dave Frohnmayer did, that the success of campus fundraising is directly tied to the presence of the athletics enterprise; he stated that he could raise more money in one football game than than at an academic event. Mea culpa to applying a broader brush to the fine details of UO athletics financing. That said, baseball (UO has a baseball team!) was established on the promise of being a profit center, and it has proven to be a loser. Perhaps the loss can be spun as a loss leader – go for it. How does baseball’s drain on the bottom line result in a positive gain for the school? Please better inform me. 1. We are laying off faculty …. Hecc approves 10+% tuition increase, immediately money starts getting blown on crap like this. Word is uopd is going to expand thrir brand new motorcycle fleet. Enjoy the layoff notices if you’re a plebe academic. This blog has gone soft…ever since that lame ice cream with the new president event. The blog also worships infantile and ignorant reporters. Condolences.